the millennial struggle. social media part 2. This one in particular focuses on Facebook and how we, as millennials, have a very unique relationship with this social media powerhouse. So… when Facebook first started, it was aimed at college students. Like… you literally had to have a college email address to make an account. The networking opportunities amongst that limited population was in my opinion, optimal. NOW, with billions of people using Facebook, there is a huge range of characters you might find on your friends list; from some of your closest friends in “real life”, to co-workers, to distant relatives, to people you’ve never actually met. All of this is fine of course, but there’s also a struggle that comes along with what’s appropriate to post and what’s not. 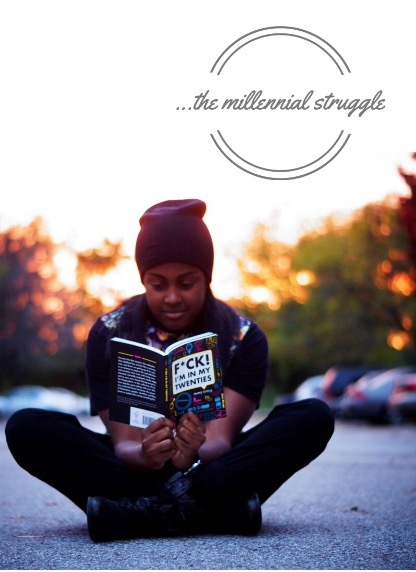 Protected: the millennial struggle. pros and cons of attending a PWI. the millennial struggle. four things school never taught you. Being an adult is tough stuff. But…it’s definitely a lot tougher when you realize school didn’t prepare you for half of what adulthood consists of. I mean, we heard about everything (at least on this list) but we weren’t really taught how to handle them. Here are Four Things School Never Taught You That Decided To Show Up In Adulthood. Health. Dental. Life. Car. Home. Renter’s. Whatever you can think of, they have insurance for it. And I mean that literally. Some people are risky and decide to go without because they don’t believe anything will happen to them. Crazy choice, but rock on, rockstar. But for people like me, who care about my life and well-being, it’s confusing as finuck (lil’ scrappy voice). Which brand do you sign up for? Does your doctor take the insurance your job offers? How much do you need to be insured for? What kinda deductible do you have? Especially when you hardly learned anything about it in school. the millennial struggle. the moment you question if you have your shiz together. Scroll through any one of your timelines and what do you see? Your friends and their newborn babies. Your friends and their engagement rings or wedding photos. Your friends in their master’s graduation pictures. Your friends traveling the world. the millennial struggle. social media. “I’m like do it for the gram ho, do it for the gram ho.”- meek mill. I have a love/hate relationship with social media as a millennial. It’s such a great resource, great networking tool, and obviously a great way to get the word out about things I need masses of people to know about. But I hate when people use it for dumb shiz. Or overuse it. Or try to use it as a supplement for getting out there in the world and actually meeting people. Or just get on my nerves. Maybe a funny video here and there. Sometimes someone catches the best sunset on their iPhone or share an important life milestone, like getting married. But I hate it when I see girls doing videos of themselves just making a bunch of faces with music playing in the background because they think its cute. Or when someone posts three+ pictures from the same bunch of selfies in a row. And don’t even get me started on when people post the one pic with the three different poses. I get it; you were feeling yourself. But save it for yourself, or for bae. Don’t have a bae? Well how about potential bae? Simply put, we don’t need all that. the millennial struggle. being pop-culture savvy while still being socially-conscious. Scrolling through Facebook one day, I noticed an increasing trend of posts about how things in pop culture were designed to distract you from other things happening in the world. For example, the claim was that Drake and Meek Mill’s beef was designed to get you to ignore what had happened in Texas with Sandra Bland. Now my question is…is it possible to be both pop-culture savvy and socially-conscious?